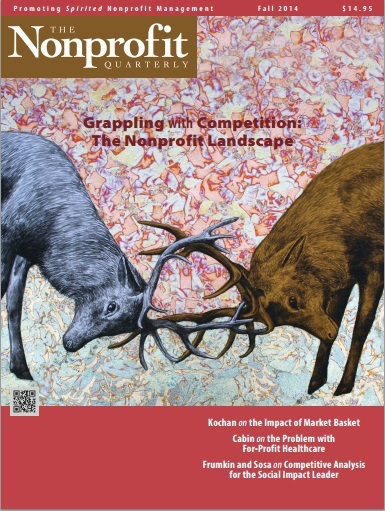 Click the cover image below to download the Fall 2014 issue of the Nonprofit Quarterly. Nonprofit Health Co-ops: Designed to Compete for the Public Good. This one-of-a-kind investigative report asks how the brand-new field of health co-ops funded under the Affordable Care Act is faring against the competitive challenge of large, well-established insurers. As it turns out, surprisingly well. Are We “Walmartizing” the Social Sector? Organizations wishing to scale would do well to prioritize impact over size and take care not to disrupt the community’s ecological balance by inadvertently competing with already existing local organizations for scant resources. Competitive Positioning: Why Knowing Your Competition Is Essential to Social Impact Success. For the social impact leader, the first step to assessing the quantity and quality of an opportunity in a given market is to map the competitive landscape. This article lays out step by step what goes into an effective competitive analysis. Stakeholders, Shareholders, and the Meaning of Market Basket: An Interview with Tom Kochan. In this interview, Tom Kochan, codirector of the MIT Sloan Institute for Work and Employment Research, lays out the larger implications of the stakeholder action around the recent Market Basket dispute.